Seachem coral plugs provide a unique, chemically advanced platform for stable mounting and growing of freshly cut corals and polyps. Designed for mounting SPS and LPS coral, Seachem coral plugs are also ideal for soft corals, colonial polyps, and various other sessile invertebrates. 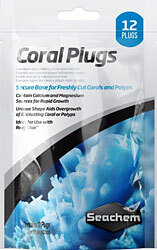 Enhanced with calcium and magnesium to aid corals in rapid and secure growth, each sturdy coral plug features a unique diamond shape that aids overgrowth of encrusting coral or polyps. Seachem Coral Plugs are designed to mesh together tightly when used in most coral culture systems so that various encrusting and colonial corals, such as zoanthids, can spread quickly from plug to plug. 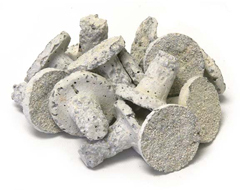 Seachem coral plugs are ideal for use with Seachem Reef Glue. Each measures 1-1/8 x 9/16" x 9/16" high and includes a 3/8" dia base.